Deeper in flavor and more powerful in body, the smoke on the Magicos is intense and finishes very strongly. Aromatically and on the palate this cigar is an absolute treat for the senses. 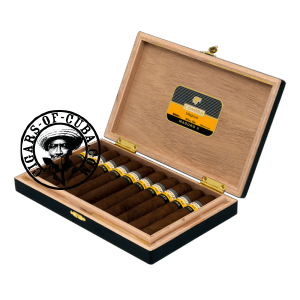 Beautifully constructed, with a rich, round smoke, this is a cigar that will challenge even the most experienced palates, with its sophisticated aromas of crushed pepper and dark chocolate. The 5 years of careful aging granted to each leaf that composes this cigar, will mean that the blend already delivers punch. The dark wrapper, 5 years aged is so pleasing to the eye and gets your taste buds going even before tasting. Lovely line of sweetness emerges as you progress through the cigar.